Anyone who has a smartphone, iPad, or Kindle knows the struggle of typing with an on-screen keyboard. It’s fine for short texts and search queries, but what if you need more? You need a reliable, portable tool – a Bluetooth keyboard. Here’s a list of the best foldable Bluetooth keyboard options on the market. They’ve been chosen based on reviews of at least 3.5 stars. All of them can be folded or rolled up for maximum portability. 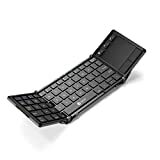 Take a look at their features and see what’s the best foldable Bluetooth keyboard for you. 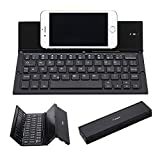 This 4-star keyboard was designed with small devices in mind – smartphones and smaller tablets, like the iPad Air and iPad Mini. The keyboard is attached to a stand, which props up your device for you. It folds up nicely when not in use. The BATTOP boasts compatibly with all devices. It’s been upgraded since its previous debut, adding little details like a non-slip mat, rounded corners, and a better frame. This model comes in black. The NOVT is a 3.5-star keyboard for smartphones and iPad Minis. It’s compatible with iOS, Windows, and Android. Additionally, this model is powered by a Bluetooth Broadcom 3.0 chip, giving it additional speed and power over other Bluetooth devices. The exterior is built with an aluminum alloy frame, so it’s sturdy. This model is rose gold, with black detailing and keys. Not all of these keyboards fold up – some of them roll up, like an ancient scroll. This 5-star keyboard can pair to 3 devices at once. Say you’re working on the company phone and your own iPad at the same time. You can use one keyboard for both, tapping a simple keyboard shortcut to jump between them. This stand supports most operating systems and devices, though larger iPads may be too physically heavy for it. This 3.7-star keyboard comes with a built-in trackpad. It’s made for all major operating systems, but the trackpad alone isn’t compatible with Apple devices. For this reason, it’s not the best foldable Bluetooth keyboard, but it’s still very good. It has a strong battery life, triple Bluetooth channels, and a tri-folding mechanism. Its dual stands mean it can handle bigger devices, or two small ones at once. This mini keyboard is ideal for smartphones. The 3.8-star keyboard is tiny, so it can fit easily in your pocket. Its smooth, sturdy keys are designed to last for a long time. Like the others, you may connect 3 devices to it at once, and tab between them. The keyboard is backlit, which is a nice aesthetic, not to mention practical when working in the dark. There are two iClever keyboards on this list. 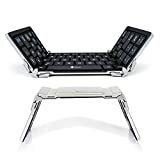 This one is a 4.4-star tri-folding keyboard. It comes in silver and white. It can’t hold up your device, but you can purchase it alongside a tablet stand for only a few more dollars. This keyboard is also larger than other portable keyboards, if you prefer having lots of space when you type. It’s made of “aircraft grade” materials for maximum strength and durability. This iClever keyboard is more pricey than the previous, but it’s worth it. This 4.1-star keyboard has some cool bells and whistles, including colored back-lighting. If you’re working in the dark, you can choose between red, green, and blue to keep your keys visible. Additionally, it has a balance stand to keep it level, wireless modes, and tri-folding capabilities. It looks good, feels good, and is built to last. It’s compatible with iOS, Android, and Windows. Jelly Comb keeps things simple. This practical keyboard may not look like much, but it’s got impressive reviews, averaging out to 4.6 stars (80% of the reviews are 5 stars). It’s very small, slightly bigger than the average phone, but very powerful. It boasts a “lightning fast” response when typing. It’s compatible with all devices, and when you’re finished, it folds neatly in half like a notebook. It’s simple and reliable. If you’re searching for a practical, affordable folding Bluetooth keyboard, this may be the one for you. The Yuzihan keyboard is unique. 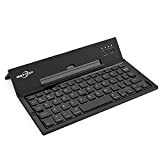 This 4.1-star keyboard doesn’t fold up. Rather, it rolls up. It’s made out of silicone, so it’s waterproof and spill-proof. It’s small, but sturdy. Additionally, this keyboard boasts silent typing, ideal for a library or class. Less stealthy is its color. This model comes in pink, but you can find it in other colors (with varying prices). Like the others, it’s easy to set up and pair. It supports all major operating systems. 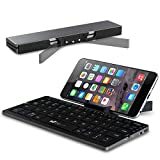 Is it possible for a full-size keyboard to still be portable? Absolutely! 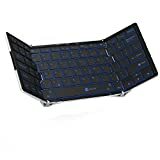 This number one best foldable Bluetooth keyboard is the biggest on this list, 11.5 inches when open. Some of the keyboards on this list can’t physically hold an iPad, but this one can. When not in use, the stand wraps around the keyboard for maximum protection. The keyboard itself boasts 4.3 stars, with excellent reviews. It has steel hinges and an aluminum shell, so it’s durable. It’s Bluetooth enabled, but also comes with all the hookups of a USB keyboard. It’s compatible with all major devices and operating systems. Consider bundling it with a wireless mouse before you check out. 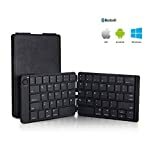 Which is the best foldable Bluetooth keyboard? People’s opinions seem to vary. What works for one person may not work for another. Luckily, there’s many products to choose from. Small or full-sized, folding or rolling, there’s a keyboard on this list for everyone. If you’ve ever tested one of these keyboards, let us know down below. 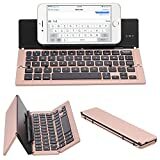 You can also comment and share the name of the best foldable Bluetooth keyboard you’ve ever tested.